It’s something that is taken for granted, since most of us speak every day. But consider this idea. Words are vehicles we can ride – in order to manage our perception. If you tell yourself “This is so hard” or “Gawd, I hate this” – then that is the road on which you are driving. Your (obedient) mind will look for “hard” and it will look for “obstacles” in your way, thus fulfilling the suggestion or instructions you have given to it. One of the words I enjoy using as a “change-up” vehicle in my life is FUN. I like to sing to myself the word “Fun” to a tune like the Camptown Races – Fun fun fun fun fun fun… FUN FUN, FUN FUN. Fun fun fun fun fun fun all the dooh dah day! It’s silly and no one has to know I’m singing this as I do it internally while I’m standing in line to cash out my purchase, or while waiting for a cab. Somehow my eyes get to twinkling, (sometimes my toes get to dancing) and people respond to that and we have… FUN! Or sing it to Moon River! The point is to place your mind in a position to look for Fun, Interesting, Appealing, Smiling, Delightful, Open Stuff. I find that maybe the first few times I sing or chant the FUN word, I might be resistant – because you know, it IS rather silly, and I have important things to do. But then maybe later on in the day or even the next day I’ve got it wired. Why not try it? Let me know what comes up for you – Your resistances, and your positive experiences. I have used this FUN vehicle when I have needed to have a conversation that I was dreading, or when I needed to do a household chore I didn’t want to do. Telling my mind to look for FUN while singing a Broadway tune to myself just crumples my barriers. Give it a try. It costs you nothing! And… it could change your life a LOT. 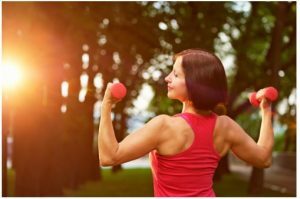 The Power of Words – FUN – MORE! 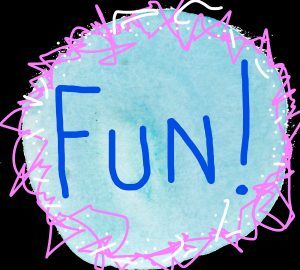 Singing the word “Fun” to a favorite show tune or saying the word “Fun” throughout the day can be a great reminder that we can break away from fear and stress, even for just a little bit. 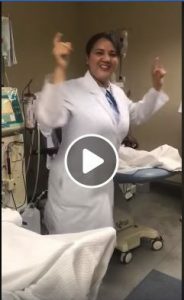 I am very excited to share this video with you (hope it comes through) that illustrates this “having Fun” even in the hospital with other patients and nurses. Take a look! Click on the video image below to enjoy! Fun is a powerful word. Fun to read about Fun. I will practice Fun more often and I am sure I will reap the benefits of Fun. What a great story! Love, love love it! As we talked earlier, words are very important. One last bit of FUN on this topic — Watch the video below for a breath of fresh air. What a GREAT laugh this man has! Laugh along, change your day! What a great story on words AND the videos were fantastic. You are such an inspiration! Thanks for sharing. 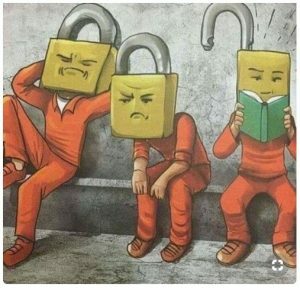 This cartoon is a reminder to keep our minds open to new ideas. Whenever you have lots of entertaining, it can mean some left-over vegetables from the veggie tray, or too many steamed vegetables from dinner. A great way to upcycle those instead of throwing them out is to put thinly sliced onions, celery, left over carrot sticks and dinner vegetables in the juice of almost finished pickle jars, olive jars or jalapeno jars. 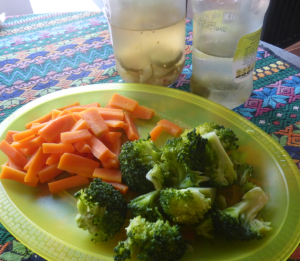 Let sit for 2 days or so, and now you have ready-to-eat snacks or salad additions without purchasing anything new! You can also add these zesty juices to store bought thick salad dressings to make them easier to pour. These flavorful liquids can be added to marinades for meats and to BBQ sauces. Or cut up these flavorful bits and add them to your tuna salads or chicken salads. 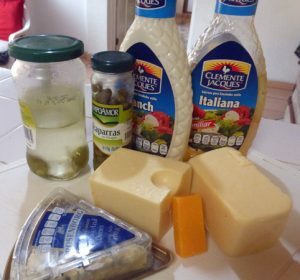 Sometimes we find ourselves with a selection of nearly used up salad dressing bottles, and jars containing a few green olives, capers or Italian pepperocinis in the door of the refrigerator. We always have various small pieces of cheese like cheddar, blue, cream cheese or mozzarella in our cheese bin. All this “stuff” takes up a lot of needless room, but we don’t want to throw any of it out. We pull out all these seemingly mismatched ingredients and put them on the counter. Chop the olives, and/or a few pepperocinis into small pieces and toss them into a large mixing bowl. Grate up some of the cheeses into this bowl (the small pieces first to use them up) add some capers and pour a little of one or more of the salad dressings into this odds-and-ends concoction. Mix well. It helps if the cheeses are room temperature because they will blend better, and you don’t want the “spread” to be too soupy. You are looking for the consistency of a light paste. Taste for flavor. Need some garlic? What about freshly ground black pepper? Add some paprika for color or maybe some dried or fresh parsley, or very finely chopped green onions. Maybe chop some sun dried tomatoes – not too many! Mix well and let sit for about 5 minutes for the ingredients to blend. Stir and taste again. You can’t really make a mistake. Each time the flavors will be different, depending on what you have in your refrigerator. Now take a loaf of sour dough French bread, or better yet, get some of those mismatched hamburger or hot dog buns! Spread this powerfully tasty and nutritious cheese spread onto the bread (parmesan cheese on top?) and broil it under your broiler the same as you do garlic toast. The cheese will bubble and maybe turn a little brown. When it looks how you want it, take it out, cut and serve! People are always astonished when they eat this bread, and we rarely have any left. But if you do, cut them up as croutons and use them on top of your next salad! These toasts are really good as a side dish to a salad or soup meal too. Don’t forget to save the jars of liquid from those olive, capers, jalapenos or pepperocinis and use them to marinate vegetables. I’ll explain about that another time! Imagine you’re in your 70’s. You are sitting in your balcony, sipping your favorite tea and just…savoring your golden years. Retirement is good and you have no financial crisis hanging over your head. Here are our tips to be debt free before your retirement. #1 Say goodbye to your pile of debts. Obviously, to live your golden age with no financial worries, you need to get out of debt fast. It’s not surprising and it’s not a picnic either, but the good news is that you can pay it off gradually. To do this, you need to know first your choices. It is better to start small than nothing. This also proves true in paying your debts. First, make sure to get an accurate report on your debt/debts. With this report, you can analyze and apply what we call, “The Debt Snowball”. This is where you start with your smallest debt and pay it off as quickly as possible. After your smallest debt is settled, repeat the process until you finally cleared all your credit. Quite the opposite is applying the Debt Avalanche method to settle your credits. In this option, you pay off the debt that has the highest interest rate. Then, you work your way through to the lowest interest rate debt. Here’s a quick tip: What is important for both methods is to still pay the monthly minimum required payment for each debt, so you can still meet deadlines and avoid fees. Aside from these two, you can also choose to transfer your credit card balance to a different card. This means paying off one credit card using another card. In the same sense, you can also settle your debt by getting a personal loan. Of course, this goes without saying that these methods are both dangerous especially if you don’t use credit responsibly and you’ll likely just end up further in debt. Further options are debt consolidation, debt settlements, or declaration of bankruptcy. #2 Fatten up your savings. For some of us, applying for debts might be the easiest way out to solve a financial crisis, but it doesn’t have to be. Instead, having solid savings can be our trustworthy rescuer when we’re deep-neck drowning in financial nightmares. To do this, you have to set tangible goals. Find out how much you can afford to save or how much you need to save to live comfortably in your retirement years. However, let’s face it: the world is full of material things and all things come with a price. This is the problem, my friend. Saving may be the last thing you’ll think of when you’re out living your life to the fullest. You guessed it: Larger paycheck is the ultimate key to being debt free before your retirement. When you have a larger income, you can spend more freely and you can pay off your debt faster. Also, in today’s technology, there are a thousand opportunities waiting for you. If you have a low-paying full-time job, you can get a side hustle to earn additional income. Earning more cash allows you to enjoy more of what life has to offer. After all, financial freedom is truly one of today’s goals. #4 If you’ll spend money, be wise about it. 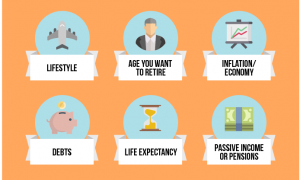 #5 Get help from financial advisers. Luckily, financial advisers are available to help us make the best decision about our money. You can reach out to these professionals and get an expert’s advice on how to handle your money. This will help you in creating years that are debt-free and peaceful. It appears that garages no longer serve their purpose as parking spaces for cars. Nowadays, it’s not uncommon to see a garage filled with junk or seconds as a home workshop. Some households even convert their garages into entertainment centers. But having a garage is beneficial for your car. Here are five reasons. The most obvious advantage of a garage is that it protects your car from the elements, no matter the weather conditions. Rain, snow, and wind are your car’s biggest enemies as they slowly chip away on the vehicle’s exterior. Dirt and acid that are left uncleaned can cause rust, diminish the car’s shine, or worse, leave permanent damage. In extreme weather conditions, a car left outside is vulnerable to hail, falling tree branches, and other debris that can cause broken windows and deep dents. Also, in the summer, when the temperature is exceptionally hot, be wary of UV rays as they are known to cause damage to your car as well, both inside and out. Garages are enclosed spaces that are typically locked. Keeping your car in one will dramatically decrease the chances of it getting stolen. Since cars are such huge investments—probably the most valuable asset in any household—it’s best that it’s kept away from public view. Parking outside exposes your vehicle to scratches and vandalism. Nothing ruins a car’s beauty more than graffiti or a visible dent or scratch on the side does. Fender flares, side mirrors, and bumpers are the most at risk here, but vandals can happen anywhere on your car. Don’t make it easy for people to harm your vehicle. 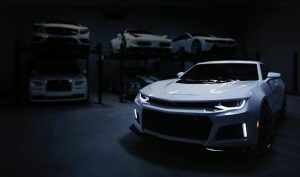 Companies often offer lower insurance premiums if you have a garage where you can routinely store your vehicle. Even if the space isn’t even yours—like a neighbor’s garage that you rent out or public parking that is part of a condominium complex—you are likely to still be eligible. Cars that are kept in gated estates also get lower premiums. The reason for this substantial drop is that there is reduced risk of harm to your car when it is safely parked in a garage. During the cold winter months, the garage is the ideal place to store your car warm. This heat keeps the vehicle’s essential fluids in stable condition. The engine oil, for example, will be thinner, allowing for better lubrication of the internal parts at start-up. The result is an engine that runs more efficiently, as compared to one in a car that has been sitting outside. This efficiency affects every other internal component. This is most likely felt in the car’s heater and air-conditioning system. In cold weather, the interior will warm up faster than it would when the car is out in the open. The same is true for hot days. Perhaps the best reason to keep your car inside a garage is for your own convenience. What if it’s raining and you have somewhere urgent to go? You obviously can’t wait out the rain. A garage lets you access your car without any problem, keeping you fresh and dry for the day ahead. Winters can be as challenging. You’ll wake up to a thick coating of snow on your car’s windshield. Before going anywhere, you’ll have to clear everything off. By the time you’re able to do that, either you have frozen to death or wasted a lot of time. Having a garage means that your car is always good to go whenever you are. A legacy journal makes for a personalized, heartfelt gift that your grandchildren will treasure for a lifetime. How should you get started, though — and what exactly goes into the creation of a legacy journal? Legacy journals stem from the ancient Jewish tradition of passing down written memories and life advice to future generations. Legacy journals follow a child’s growth and development throughout their lives, capturing the magical moments that make your family complete. Here’s how to create a beautiful tribute guaranteed to touch any grandchild’s heart. The first step in creating a memorable journal involves selecting an appropriate medium. Given advances in technology, some may opt to create an electronic journal, while others prefer the personal touch of handwriting in a specially selected journal book. 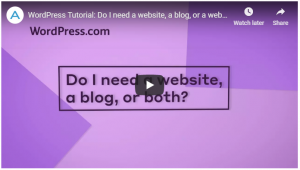 Truly tech-savvy grannies can easily set up a WordPress account and begin typing away. This works particularly well for those with arthritis, who may find typing easier on painful joints than holding a pen. Tinybeans presents the option of a secure sharing page where family members can upload photos and share only between other family members who join, eliminating privacy concerns. For those who prefer a quill to a keyboard, select a journal that honors the grandchild eventually receiving the book. Creative nanas may choose to decorate the cover scrapbook-style while others prefer journals already beautified with patterns, flowers or leather. The hectic pace of everyday life can leave grandparents with little time to write. Many grandparents today choose to work part-time well into their retirement, while others assist working parents with child care duties and cleaning tasks. Some do both. Select a time to write when the house quiets down and reflection comes easily. Aim to schedule at least 30 minutes per month to add to journal entries. Investing in a tape recorder can help remind forgetful folk of special details they want to include in their writing later. The contents of legacy journals vary. Some people prefer to journal about only special occasions, such as birthdays, graduations and holidays. Others consider their legacy journal to serve as their last words of wisdom to their families upon their passing. Anything and everything, from special moments to large milestones, makes for excellent journal fodder. Pay particular attention to capturing events that occur in a child’s early years that they won’t remember but will enjoy reading about just the same. Even though many grandparents include words of wisdom intended to enlighten future generations, words coming from the heart mean even more. Celebrate the successes grandchildren achieve and shower them with praise. Include details such as the feelings experienced when holding the little one for the first time. Use humor when appropriate — every family shares little inside jokes that make for marvelous memories. Sprinkle in words of wisdom among the nostalgia. While legacy journals center on emotions, that doesn’t mean they can’t include practical gifts within. One popular emerging trend involves buying children stock and other investments instead of gifts of toys or clothing. Including information regarding these investments in a legacy journal makes for an extra-delightful surprise, especially among those planning to gift their journals when grandchildren reach adulthood or graduate from college. Imagine the smiles when grandchildren learn they already have the financial resources they need to buy a home or attend graduate school. While most legacy journals arise from one-person contributions, getting the entire family, or at least certain members, involved can create an even more memorable gift. Everyone views memories of special events through their own unique lens, and additional praise from family members and friends alike make grandchildren feel especially accepted and loved. Legacy journals make the perfect place to preserve favorite letters, cards and family photos for grandchildren. Those utilizing a traditional paper journal can include these items scrapbook style. People creating electronic legacy journals can scan and upload postcards from family vacations and pictures of special celebrations. The final step in creating a legacy journal involves deciding when to make the gift. 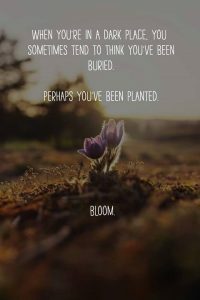 Timing really matters. 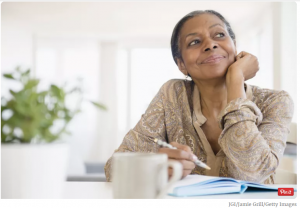 Grandparents who consider their legacy journal to serve as a sort of last will and testament may wish to rent a safe-deposit box to be opened only after they pass on. Others, especially those who have made surprise investments for their grandchildren, may wish to present their journal upon the child’s high school or college graduation. Some choose to gift their journals when their grandchild has their first baby to encourage younger family members to continue the tradition. Legacy journals make the ultimate personalized gift. Leaving a piece of yourself and your treasured memories allows your words and traditions to pass down to future generations. Get started on your own journaling journey today. There are lots of ways to add Pizzazz to your life right now. One way is through color, music, dance, travel and changing up an old pattern. An easy way to add spark is through food. Below is an quick recipe, able to be prepared in minutes, and it will uplift burgers, sandwiches or use as a dip for chicken wings, ribs, or vegetables. This is a tiny can of Mexican Chipotle Chilis in Adobo sauce. You can find it in your international food section of your grocery store. There are about 5 chilis in the can, the size of a “fat” thumb. Take out one chipotle, slice it open and scrape out the seeds. Chop into a paste. Put this paste into a small bowl and mix in about 1/3 cup of your favorite Ranch or Caesar dressing and let sit for about 6 hours. Add a few drops of water if you want the consistency to be thinner. Take the sauce out again and stir. It’s ready to serve! The smoky, slightly spicy chili in the salad dressing will AMAZE your friends. Great as a dipping sauce for buffalo wings or ribs. Or as a vegetable dip. It’s also terrific on a burger or sandwich. This dipping sauce will definitely add PIZZAZZ to your meal. Susan: Sounds good, but my husband has Rosacea often triggered by spicy foods. Any suggestions for toning down the spice? 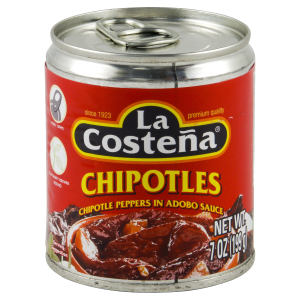 Akaisha: Chipotle is one of the lesser spicy chilis. This chili-to-salad dressing ratio gives just a hint of picante. Just a TINY bit of bite. I would make this recipe, let it sit for the 6 hours or so… and then taste it. If it’s too spicy, simply add more salad dressing. Chipotle is known for its smoky flavor more than its spice. Also, since chili is a product of nature, each chili is different. So depending on the certain chili in the can, it will change thespice. You could make one dip for your husband (diluted with salad dressing) and one revved up for your guests.